Globe Fashion Runway : The cutting-edge fashion show coverage from Paris,Milan,New York and London. 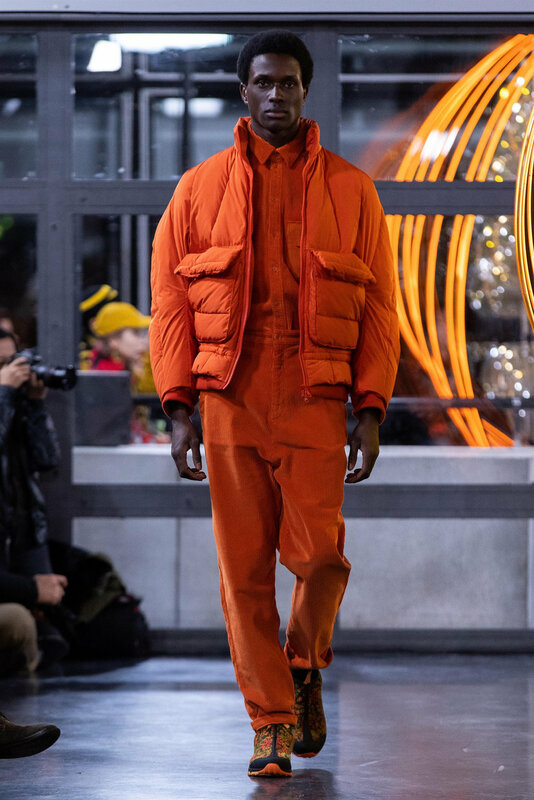 Henrik Vibskov presented yesterday his Fall/Winter 19 show during Parisian Menswear fashionweek. This collection reflects both the romantic idea about nature and how we interact with it, and the more extreme technology, making it possible to increase and speed up natural processes, like indoor, vertical- and sky farming, green rooftops and urban gardening. The clash between wanting to maintain nature pure as it is and the need to interfere with it, is intriguing and terrifying at the same time. The idea of farming, nature and technology was the inspiration for the development of the collection. Voluminous silhouettes with details of binding layers together and prints and embroidery which remind of flowers, fruit, vegetables, endless fields, and the long human arms in the agriculture. Humor with a slight touch of melancholy and a reminder of the importance of environmental awareness is present. A long kinetic installation is slowly moving in waves, while performers dressed like gardeners are walking inside of it. They are carrying ceramic water cans, taking care of the radishes growing inside of it. The radishes are grown in the Henrik Vibskov Studio in Copenhagen and are placed in recycled beer kegs as a part of the urban farming experiment, hence the name of the collection. The installation is a take on the idea of an intriguing future-farming lab.